Michigan is ground zero of the economic recession. No state has been hit harder by previous failed economic policies and the loss of America's manufacturing sector. That is why it is crucial that The Wolverine State carry the torch of the new clean energy revolution in the United States. At least that was the message Democratic Governor Jennifer Granholm conveyed to the audience gathered at the Center for American Progress in downtown Washington, D.C. to hear her speak about the progress Michigan has made in clean energy on the one year anniversary of Vice President Joe Biden's trip to Detroit in which he announced a massive investment of Recovery Act stimulus funds into Michigan's advanced battery industry. According to CAP Vice President Sarah Rosen Wartell, who provided introductory remarks before the governor took the podium, of the $2.4 billion in advanced battery funds, over half went to Michigan. She also noted that the state is now home to sixteen battery companies representing nearly $6 billion in public and private investment, creating almost 62,000 jobs. Perhaps it was the fact that Granholm was born in Vancouver, Canada and her grandfather immigrated from Sweden and her grandmother came from Norway -- all three countries being on the cutting edge of the transition to clean energy -- but she was about as animated and excited about clean energy as any public official I've ever seen. Granholm sadly pointed out that Michigan has lost jobs every single year of the first decade of the 21st century -- over 800,000 jobs lost out of a population of ten million. That staggering figure is due to Michigan being at one time the automotive capital of the world and having seven times more manufacturing employment than other states, so they were hit seven times as hard. 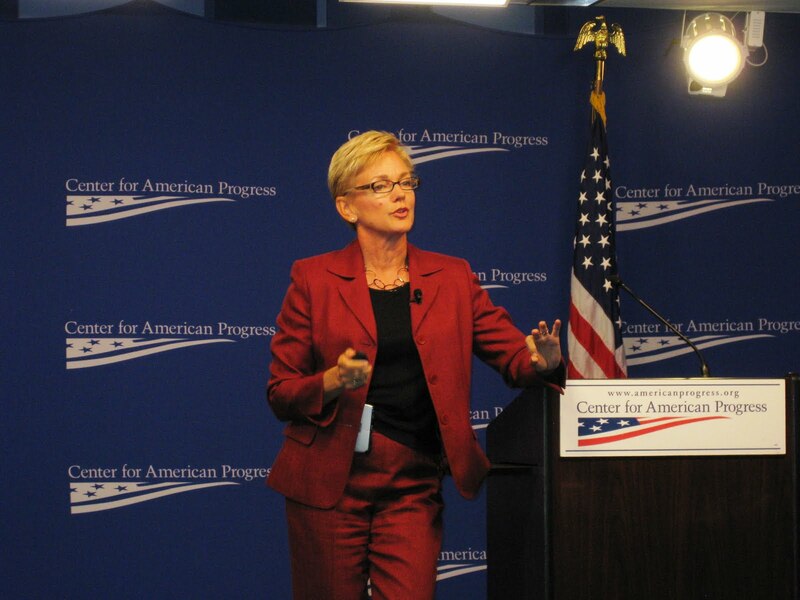 "We are the poster child for this global shift in manufacturing jobs," said Granholm. "So I’m obsessed about creating jobs for everyday citizens in America and that’s why this clean energy opportunity is so huge." She told a devastating story that took place when she first took office in 2003. A town called Greenville had just found out that the Electrolux-owned refrigerator factory was threatening to go to Mexico and bring the 2,700 jobs with it. The governor held a meeting with representatives from the town of 8,000 and the company management. After offering amazing incentives like zero taxes for twenty years and building them a new factory, the management told Granholm that it was more than they expected, but that they can pay $1.57 an hour in Juarez, Mexico so there was nothing they could do to overcome that. Afterwards Granholm attended what employers call the "last supper" where the hundreds of recently jobless people gather one last time to say goodbye and ask each other what they are going to be doing next. She said a 48-year old man who was with his two daughters walked up to her and told her that he had worked for the company for 30 years and that his father and grandfather worked for the company and that he went from high school to factory and it was all he knew how to do. With his children on each side of him he asked the Governor point blank: "I'm too young to retire. Who's going to hire me?" "That question has been asked in communities all across the industrial Midwest as we have seen this manufacturing base hollowed out in America," said Granholm. "We don’t make things in the United States. We are a weak nation. And that’s why this energy bill gives us such an opportunity." But things have changed in Michigan since the state signed an energy package into law in 2008. Since then there has been somewhat of a mini renaissance, although the unemployment is still at 13.2%, second only to Nevada. Granholm stressed how important it is to pass a national clean energy and climate bill because states can only go so far in pushing clean energy jobs through legislation. She said that nations that have feed-in tariffs like Canada and Germany are stealing jobs that could be here in the U.S.A. She also mentioned that Sweden -- a country of similar size to Michigan -- has created 400,000 jobs through clean energy and that there is no reason Michigan can't do the same with the right policy in place. "We are missing out if we don't adopt smart policy," Granholm said. "The Federal Government must play a role by passing an energy bill. With the right policy in place it will send market signals and will bring jobs." And regarding that town that lost all the refrigerator factory jobs back in 2003? Well, Granholm was happy to report that Greenville plans to go completely off the grid by powering every school and city building with solar energy.